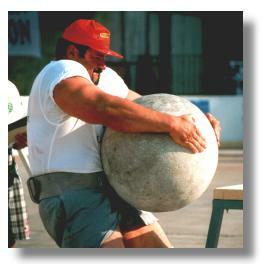 The events in strongman are geared to test all aspects of strength. From brute power, explosive power, upperbody, lowerbody, grip strength, and overall body strength. Events like truck pull, log lift, atlas stones, the squat, and farmer's walk to name a few. The truck pull is probably the most visualy spectacular event is strongman. It requires overall body strength. The weights of the veichles often exceeds 16 tons. Many different types of veichles have been used over the years, trams, tractors, big rigs, and even a airplane. 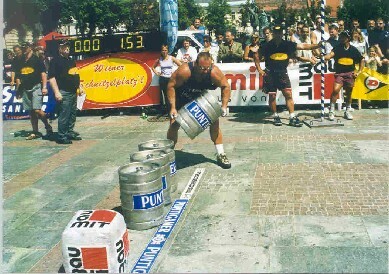 The farmer's walk is probably the most used event in strongman today. There is hardly a competition that doesn't have it included. The most common implements used are 2 long cylinders, often oxygen cylinders. Some other stuff that has been used, logs, milk cans, and metal suitcases to name a few. The event is done for distance, but most often for time. Loading events are done with a variety of different object. Things that have been used include, beer kegs, chains, anchors, logs, sandbags, and train wheels, just to name a few, if you can think of it, it has probably been used. 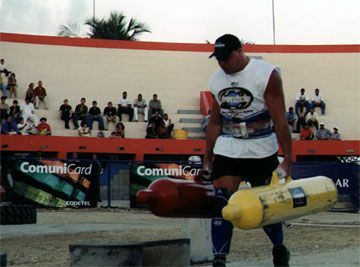 The event usually includes carrying 3 or more objects a couple meters(10 or so) to a platform were they have to be placed. 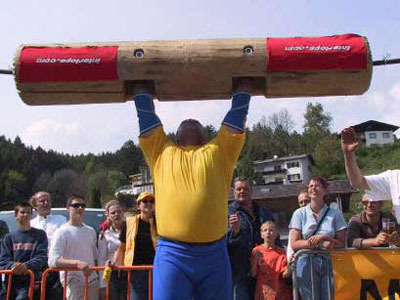 The log lift is another event that can cause problems for even the strongest of men. It may look like a overhead press, however it is much harder. When you have the log in the clean possition its center of gravity is out in front of you(unlike a bar). The diameter of a log is usually from 8 to 12 inches. This event is done for both reps and for maximum weight. The current recognized record in this event is 185kg. 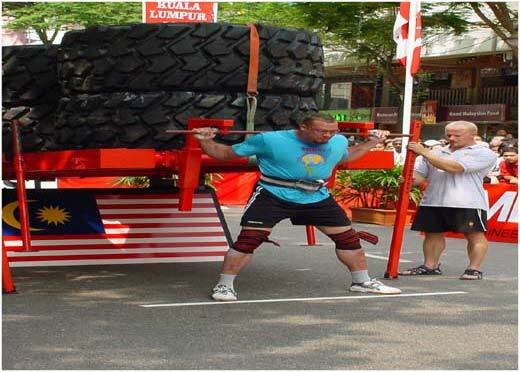 The squat has been used in strongman since the early days of the World's Strongestman Competition. It is occasionaly done for a maximum weight but most often done for reps. It is a event that most serious weight lifters can relate to as they do this exercise in the gym themselves. To discuss strongman events with like minded people stop by the Strength Discussion Forum.